Federal Game-Shok 22 WMR Ammo 50 Grain Jacketed Hollow Point ammo for sale online at cheap discount prices with free shipping available on bulk 22 WMR ammunition only at our online store TargetSportsUSA.com. Target Sports USA carries the entire line of Federal Game-Shok ammunition for sale online with free shipping on bulk ammo including this Federal Game-Shok 22 WMR Ammo 50 Grain Jacketed Hollow Point. 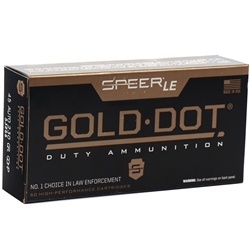 Federal Game-Shok 22 WMR Ammo 50 Grain Jacketed Hollow Point ammo review offers the following information; For nearly a century Federal Ammunition has put its focus on manufacturing quality products with cutting edge technology. This dedication to excellence has given Federal a competitive edge as an ammunition technology giant. Today the company is well known for producing high grade centerfire, rimfire, and shotshell ammunition that shooters everywhere know and trust. 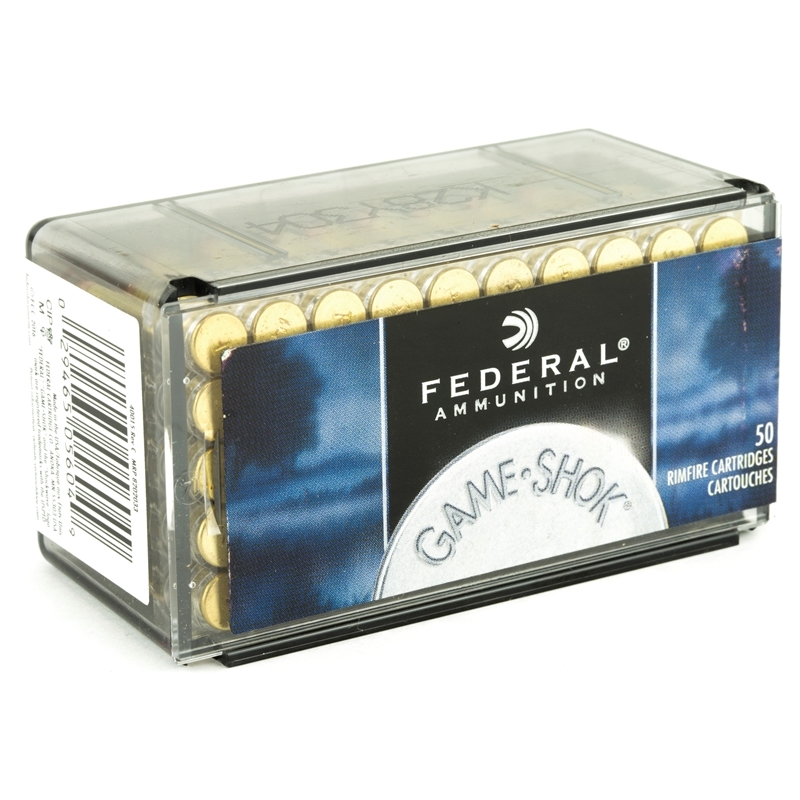 Federal Game-Shok 22 WMR ammo features a 50 grain Jacketed Hollow Point bullet. The jacketed hollow point provides increased accuracy with rapid expansion on impact, and is designed to ensure smooth feeding in auto-loading firearms. Game-Shok 22WMR ammo provides hunters and shooters with exceptional performance, and is a step above other loads for varmint and small game hunting. This 22 WMR ammo transfers all energy on impact and shatters on hard surfaces for increased safety while hunting. No matter the game, this 22 WMR ammo will take any hunting experience to the next level. Federal Game-Shok 22 WMR ammo is non-corrosive new production ammo made with brass cases and boxer primer. This jacketed hollow point bullet has a muzzle velocity of 1530 feet per second and a muzzle energy of 260 ft lbs Federal Game-Shok 22 WMR ammo is packaged in a box of 50 rounds or a case of 3000 rounds. Purchase a case of Federal Game-Shok 22 WMR bulk ammo from Target Sports USA and receive free shipping! The jacketed hollow point provides increased accuracy with rapid expansion on impact, and is designed to ensure smooth feeding in auto-loading firearms. Game-Shok 22 WMR ammo provides hunters and shooters with exceptional performance, and is a step above other loads for varmint and small game hunting. Federal Game-Shok 22 WMR ammo is non-corrosive new production ammo made with brass cases and boxer primer. 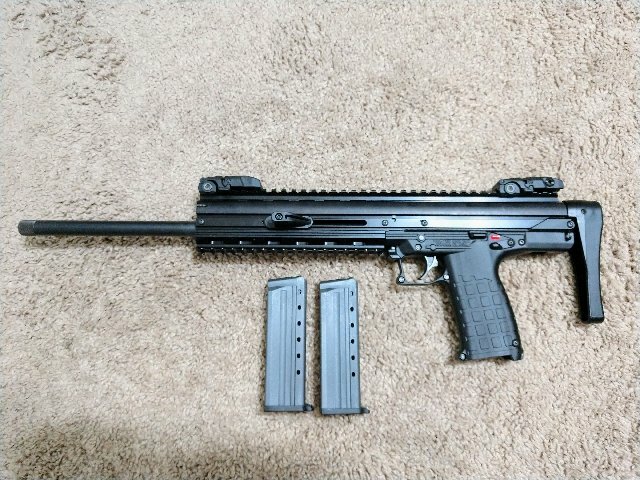 I have a Kel-Tec CMR and this ammo runs flawlessly in it !!! Kel-Tec has a reputation of liking certian ammo with bullet weights of 40 grain or higher. I like Federal 50 grain best but I was not unhappy with CCI Maxi-mag 40 grain either. Shoots great out of my boot action Marlin.